Here is one of our personal favorites! A Western white washed barn wood hat tack coat rack! The white washed barn wood is the perfect background to highlight the cowboy stampede! Plasma cut metal design that is rusted and coated with polyurethane creates a charming "rustic" look for this useful entryway display to hang your hat on! 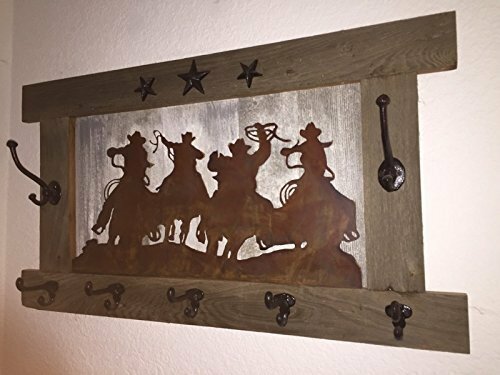 ***MEASURES 32″ WIDE BY 15″ TALL*** Great for your entry way or hallway or BARN even! ***Cowboy UP! *** Please call 877 349-0001 with any questions or for special requests!